Your little cake village is cute! I've made Sarah's gingerbread Kitty, it's a wonderful cake. Think I might make it with my Santa pan this year:@) Glad you had a nice Thanksgiving! What a beautiful trio of grandgirlies! Love Avery’s shirt “still living with my parents.” Ha! Good Gingerbread is wonderful, glad that you have found “the recipe.” It sure makes darling gingerbread houses. Those cookies are very cute! What fun to have your cute little grandgirls there to have some baking fun. I just love gingerbread. It was my dad's favorite, too. I love gingerbread too and the wee houses are really cute! Those little girlies look pretty happy holding their plates. Christmastime is so much fun with the kids around. Have a lovely last week of November, sweet Kitty. Hugs! I've printed off Sarah/Kitty's gingerbread recipe - thank you! I can't wait to get baking soon. Hugs hugs hugs. Delicious recipe and adorable princesses!So cute!Hugs! 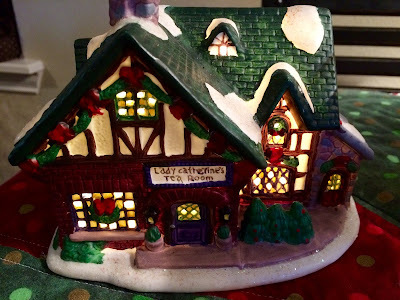 I'm loving your charming "Lady Catherine's Tea Room." The turkey gobble cupcakes and gingerbread house cakes are almost too cute to eat. The only gingerbread that I'll be enjoying here is gingerbread black tea! This is such a lovely vignette Kitty. The pretty Christmas Tree plate and mug are the perfect dishes to go with the sweet Christmas Tea Room house. I love gingerbread and I will have to try this recipe Sarah shared with you, sounds delicious. The girls are adorable holding their cupcakes made with instructions from Mary. Such a sweet post! 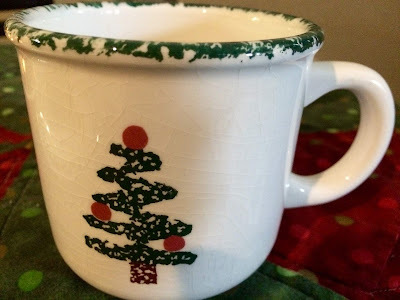 I am craving gingerbread this season, and this will fill the bill! Something about gingerbread this time of year reminds me of the very best of my childhood. The smell alone transcends me!!!!!!! I just love gingerbread but only have made cookies. I would love to try this recipe. So sweet to have your granddaughters bake with you! How fun to bake with your granddaughters. Cooking creates so many positive memories. The turkey cupcakes are adorable. 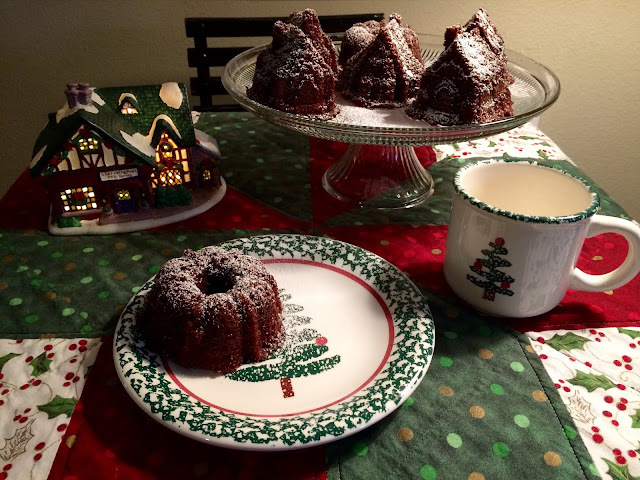 I'm hosting a Christmas tea and would love to try your gingerbread cake. I really like gingerbread, but in some recipes I've tried the molasses has been too overwhelming. 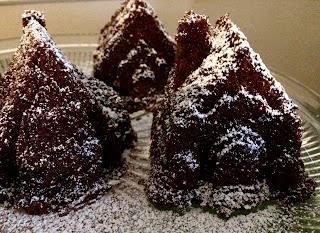 I have a mini bundt pan (not as cute as you snowy village) that I may try. It's fun to serve individual cakes at tea. This is absolutely the epitome of why we blog! Sharing friendship through recipes, crafts, devotion to making our homes beautiful, and family events. I love this Kitty. Your setting with that beautiful quilt base, the tea room and connections from your mom to Cissy, and Sarah's recipe - so meaningful. I love that you also created Mary's recipe with your grands. I should try that recipe for gingerbread. My husband would love it! Those cake forms are perfection. Oooooh... That gingerbread cake looks delicious! Thank you for sharing... and what sweet memories you have with your girls! Kitty, I look forward to see what you are doing every week. 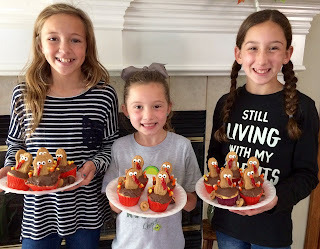 The girls looks so happy with their gobble cupcakes! Your vignette this week is adorable. I love your dishes, quilt, and village. Those treats sound delicious. Glad you have found "the recipe." Your cake pans are too cute! I hope you had a nice Thanksgiving. How fun to be baking in the kitchen with the grandchildren! The gingerbread looks and sounds so good. Thanks for sharing at our Cooking and Crafting with J & J.
I'm not a gingerbread fan but yours look awfully cute! I've never seen them in these beautiful shapes. Didn't know your name was Catherine :) and that Cissy is named after you. I'm sure your kitchen is going to be putting out some real treats with those adorable grand children of yours during the holidays! A gingerbread Christmas village...how perfect! Is there no end to your creativity? As delicious as they surely are, I would have trouble messing up that adorable village...lol! Well......maybe not! Kitty, I love your gingerbread village--too pretty to eat! Gingerbread is such a perfect cold-weather treat with a nice cuppa tea! These are adorable and sound delicious... I love teas and have been wanting to try Republic of tea for awhile now. :-) Enjoy the rest of your week! Your Gingerbread Houses are just precious and so are those Turkey Cupcake your grandgirls made! Hope you are enjoying the season, we are sure having some great weather! Hope you are having a good week and thanks so much for sharing with us at Full Plate Thursday!